Breaking News: Big Scientific Free Speech Win! In a 335-page ruling handed down today, an Administrative Law Judge with oversight of the Federal Trade Commission (FTC) has upheld the right of pomegranate juice manufacturer POM Wonderful to tell consumers about the health benefits of its juice. Since 1996, POM has invested over $35 million to do scientific research on their pomegranate products at 44 top universities and scientific centers around the globe. Over 70 of their studies have been published in significant peer-reviewed journals, validating the health benefits of the pomegranate and pomegranate juice. What makes this ruling significant is the fact that the judge said, “The greater weight of the persuasive expert testimony in this case leads to the conclusion that where the product is absolutely safe, like POM Products, and where the claim or advertisement does not suggest that the product be used as a substitute for conventional medical care or treatment, then it is appropriate to favor disclosure.” While we are still studying the ruling, it seems to indicate that other safe products may also be allowed to disclose scientifically validated studies about their health benefits. 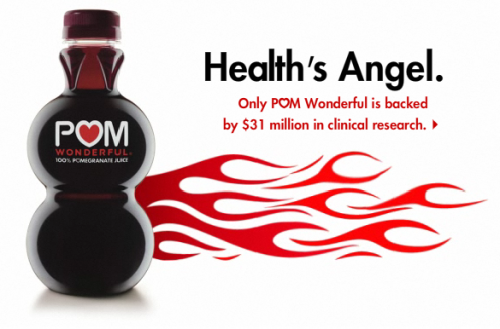 The ruling also implies that Roll Global, POM Wonderful’s parent company, will not need to get FDA approval before making health claims about its food products, nor will it have to conduct the kind of double-blind, randomized, placebo-controlled studies that are required of the pharmaceutical industry, and which the FTC was illegally insisting on. As we reported last year, the FDA allows food and supplement producers to describe the role of a nutrient or dietary ingredient as it affects normal structure or function in humans—for example, “calcium builds strong bones” or “vitamin D boosts immune system function.” However, one cannot legally cite the science showing that vitamin D prevents and treats the flu. The flu is considered a disease, so this is forbidden. The FTC, however, has been claiming that even structure/function claims cannot be made unless two random-controlled human clinical trials, or RCTs, are performed! And that’s two RCTs for each product, not each ingredient. Even one RCT is tremendously expensive, so to require two for each product before any health claim is made is a nearly impossible undertaking. Both FDA and the FTC regulate health claims about food (and dietary supplements are defined as a food), but the FTC covers health claims in advertising, whereas the FDA is concerned with health claims on food product labeling. The difficulty here is that through a series of lawsuit settlement agreements (“consent decrees”) taken against food companies by the FTC, the lines between the FTC and the FDA jurisdictions are blurring, particularly in regard to health claims. In its consent agreements—under threat of severe sanction if not agreed to—the FTC has forced companies to agree that no advertising claims could be made unless (a) there was prior approval by the FDA, and (b) it was supported by two double-blind, placebo-controlled studies—a pharmaceutical standard. In 2010, POM Wonderful sued the FTC for blurring those lines. POM alleged that the FTC was trampling on their first amendment rights to make claims about pomegranates and pomegranate juice—claims that they said were supported by reliable scientific evidence. POM argued that FTC was illegally trying to create a new standard, whereas the current legal standard is that a claim does not require FDA approval and must simply be supported by competent, reliable, scientific evidence. The [FTC] cannot make unencumbered commercial speech dependent upon anything other than the requirement that the speech be non-misleading. Speech not approved by FDA may be true. Speech not supported by a set number and kind of human trials may also be true. The constitutional burden of proof is on FTC to prove falsity in each specific case based on the precise content of the claim. As another article in this issue makes clear, the battle for free speech about science is still far from won. We are only in the early days. But the POM case is a major step forward and worth celebrating.